The Pennsylvania Convention Center acquired Ortiz’s Llena de Luz y Lucha; Madre de Mi Corazón; El Niño Consentido. 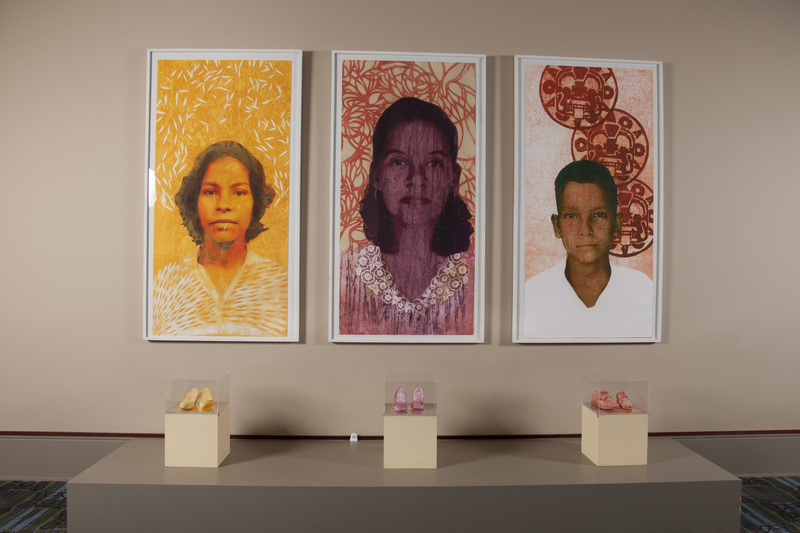 Each of the three prints and their corresponding three sculptures tell one of the many immigration stories of her family. All three images of Ortiz’s family members reflect struggle, conflict, nostalgia, and how immigration impacts the family dynamic. Pictured here is Llena de Luz y Lucha which is of Ortiz’s mother, Epifania, who arrived to the United States and settled in Philadelphia, Pennsylvania. The yellow pair of shoes represent Ortiz’s mother's journey to the United States. 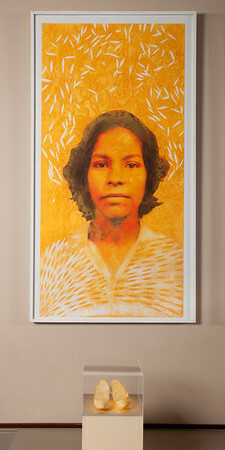 The print is the photo of her before she left Colombia at the age of 17. Her mother's name is Epifania meaning illuminating light of God. So her piece is called "Full of Light and Struggle" and carved in her shoes are phrases she needed to memorize to become a U.S. citizen.